Pope Saint Evaristus was the fifth bishop of Rome, probably holding office from c. 99 to 107-108 C.E. He was also known as Aristus. Little is known about his reign with certainty. According to the Liber Pontificalis, his father was a Hellenic Jew named Judah from Bethlehem. The fourth-century writer Eusebius says that Evaristus died in year 12 of the reign of the Roman Emperor Trajan (98-117) after holding the office of bishop for eight years. This means he was elected around the year 99. The ninth century's Liber Pontificalis, however, puts his episcopacy significantly earlier, relating that Evaristus was elected bishop at Rome during the reign of the Roman emperor Domitian (81-96 C.E.). Both Jews and Christians were heavily persecuted in this period, according the Christian tradition. 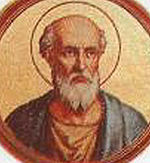 Evaristus reportedly followed Clement as the fourth successor of Saint Peter. However, contemporary scholars generally hold that a single bishop did not yet rule at Rome at this time, and the office of pope is therefore thought to be attributed to Evaristus and his colleagues retroactively by later writers. The Liber Pontificalis also reports that Evaristus divided Rome into several "titles" or parishes, assigning a priest to each, and that he also appointed seven deacons for the city. However, this, too, is thought to be anachronistic by both Catholic and secular scholars. Evaristus reportedly died as a martyr and was buried near Saint Peter's tomb in the Vatican. Very little is known at all about Evaristus, and even less is known with certainty. However, the apparent fact that he was a Jew by birth shows that Jewish Christians still held a prominent place in the Christian church at Rome 70 years after Jesus and a generation after the destruction of Jerusalem in 70 C.E. Evaristus' death as a martyr continues a tradition which supposes that all the early popes were martyrs and saints. However, in his case there is no confirmation of his death under persecution, and if he lived during Trajan's time rather than Domitian's, martyrdom would be unlikely. He is not listed as a martyr in current Catholic tradition. Two decretals were ascribed to Evaristus by Pseudo-Isidore, but they are now considered to be forgeries. His feast occurs October 26. This page was last modified on 31 March 2019, at 22:50.